Red Planet Slots is a 3 reel 5 payline classic slot machine with a space theme developed and released by Cryptologic. Red Planet is a vegas-stlyle slot machine which means you have three reels to create winning combos. The game has very distinctive design punctuated by music and ambient sound effects. Are you still wondering how the universe can surprise you? Red Planet can surely make you happy with a $40,000 Top Jackpot and high payouts. Once you start the game, you will see the reels from the window of a space ship. There you will see the icons of Alien, Flying Saucer, Saturn, Cart, Earth and Space Ship. You can bet one coin per line and play with any coin value ranged between one cent and $5.00. Note that 1 coin enables 1 payline. Thus, if you stake only 3 coins, you will cover only 3 out of 5 paylines. The maximum total bet you can wager playing Red Planet slots is $25 and the minimum one – only $0.25. Since the game has very flexible coin sizes, you can enjoy a long gaming session without taking big risks for your bankroll. Of course, if you just want to check out the game, you can play for fun. Red Planet slots offers you three top jackpots. The jackpot sums are pretty large and you can get them if you play with the maximum coin size. 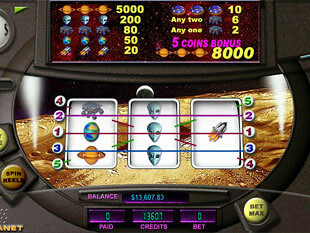 The highest Red Planet jackpot is 8,000 coins or $40,000 for 3 Saturn symbols (with the maximum bet). The second Red Planet jackpot is 5,000 coins or $25,000 for 3 Saturn symbols. The third Red Planet jackpot is 200 coins or $1,000 for 3 Alien symbols. Note, that you can hit the first top jackpot of 8,000 coins or $40,000 if you bet the max. Enable 5 paylines and choose the maximum coin denomination and get the highest jackpot! You can play the machine with 1 to 5 enabled paylines. If you trigger more than one winning combo, your winnings will be totaled and payed. The highest payout symbol after the top three jackpots is a Cart symbol. Triggering 3 Cart symbols will award you 80 coins or $400 provided you play with the maximum coin size. Inside your spaceship you will see a control panel. On the right side you have the buttons: Bet One, Spin Reels and a control tool to set your coin sizes. On the left you will see an Autoplay button. Set the number of autospins up to 99 and let your spaceship fly on the autopilot and your reels will trigger for you more and more winning combos. Red Planet slot machine is a rewarding vegas-style classic slots game with really large jackpots, interesting design, ambient and dynamic sound effects. The machine offers you large payouts but at the same time gives you an opportunity to play only with one penny. Spin the reels inside the spaceship and hit the top jackpots!